Whitney Tarver, a senior majoring in sport management at High Point University, has landed a summer internship with the Atlanta Dream – a WNBA team. Tarver’s responsibilities include handling donation requests, and coordinating community appearances and post-game autograph sessions, among other things. She works in multiple departments in addition to community relations, such as media and public relations, because of the smaller size of the organization. High Point University will host an array of spectacular music thanks to the Eastern Music Festival, which will be making a stop at the university at 7:30 p.m. on July 13 in the Hayworth Fine Arts Center. The program will consist of a wide variety of sounds, with styles ranging from well-known tunes performed by a sensational brass quintet to brilliant piano arrangements. Emma Cernansky, a rising senior at High Point University, is spending her summer fighting crime thanks to an internship with the State Bureau of Investigation in Greensboro. 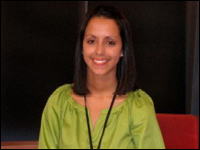 Cernansky, a criminal justice major, began her internship on May 18 and says she has already learned a great deal. 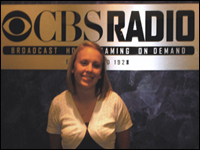 Tara Dyer, a rising senior majoring in communication at High Point University, is ready for the airwaves thanks to a unique internship with CBS Radio in New York City. As part of her internship, Dyer is gaining knowledge of how to maintain and manage multiple spots on the radio stations for many clients. She sits in on brainstorming sessions for their patrons, such as Lincoln and Jimmy Johns. She also has the opportunity to dine with the head of each department once a week. 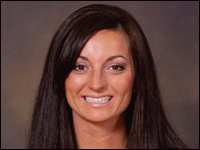 Lyndsey Boswell has been named High Point University’s first varsity women’s lacrosse coach, announced Athletics Director Craig Keilitz on Tuesday. Boswell comes to the Panthers after three seasons as head coach at St. Andrews Presbyterian College and will be guiding the Panthers in their first varsity season in 2010. 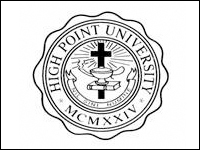 The Evening Degree Program at High Point University will host two Open House events this summer- one on the main HPU campus and another on the Winston-Salem campus. The events will be held from 5:30 to 6:30 p.m. on July 14 and July 16. 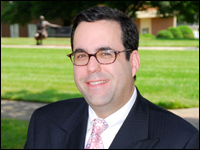 Dr. Richard Parker, associate professor of business in the Plato S. Wilson School of Commerce at High Point University, recently provided commentary for “Real People, Real Stories,” a program on WFDD, the local National Public Radio affiliate. Parker spoke on the topic of “International Collaboration vs. National Isolation” during the program, which aired on May 24. Laura Eldridge, a senior majoring in sports management at High Point University, has scored a summer internship with Nashville’s professional hockey team – the Predators. Eldridge works with the ticket operations department in the Sommet Center, which is the Predators’ home rink. Her duties in this area require her to work events such as the Country Music Association (CMA) festival and the Country Music Television (CMT) awards. Cassidy Cloyed, a rising senior majoring in business management and human relations at High Point University, is hard at work in Asheville this summer thanks to her internship with the Asheville Area Chamber of Commerce as a member services intern. Cloyed is spending her time working in the Membership Department with event coordinator Laura Wolf. 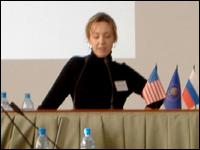 Dr. Lauren Erin Brown, assistant professor of U.S. history at High Point University, has been awarded a Fulbright Scholar grant to spend a semester at the Russian State University for the Humanities in Moscow, where she will teach “Made in the U.S.A.: American Bodies as History, 1900-1960,” and offer teaching support in 20th-century U.S. cultural and diplomatic history. Karl Hengeveld, a 2005 graduate of High Point University, has been busy since graduation thanks to a special project that has taken him to Central Asia. 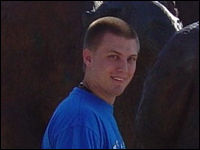 Hengeveld, who majored in computer information systems, is working with the JESUS Film Project, which is a ministry of Campus Crusade for Christ – an organization with which he was involved during his time at HPU. 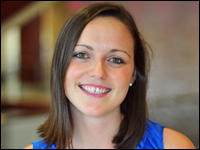 Gena Smith Thomas, a 2006 graduate of High Point University, is putting her education to work internationally. 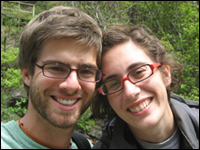 Thomas, who majored in English and minored in political science and Spanish, will be moving to Mexico near the end of July to teach English as a second language to 6th-10th graders. 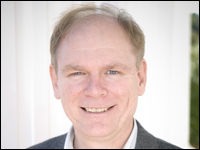 Dr. Gerald Fox, associate professor of economics at High Point University, was recently referenced in a Harvard MBA course project on competitive advantage. “Toward the end of spring semester, I was interviewed by second-year Harvard MBA student Sebastian Giwa on the subject of the North Carolina furniture industry,” Fox says. 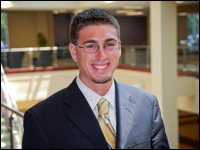 Joshua Fox has been hired as a resident director in the Office of Student Life at High Point University. Fox oversees the Sixth Street Apartments and York Residence Hall. His duty requires him to look after the buildings’ environment and students’ well-being by working with the safety office and resident assistants. 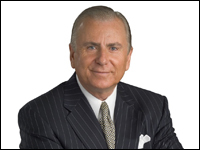 Dr. Nido Qubein, president of High Point University, was recently elected president of the Big South Conference during the League?s Council of Chief Executive Officers meeting, held May 29 in Rock Hill, S.C. This will mark Qubein’s first year as a member of the Big South’s Executive Committee; he will serve his two-year term through the 2010-11 academic year. 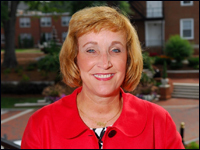 High Point University will host the Educational Leadership Summer Institute, which will include a full day of events, on July 24. Events will be held in the Phillips Hall Francis Auditorium. The theme will be “Leadership in an Age of Dramatic Change: Practical Solutions from Proven Leaders,” and will allow participants to gain insights from various leaders with established track records for producing positive results. Claudia Mota, a junior majoring in communication at High Point University, is spending her summer behind the cameras thanks to a unique internship with WGHP Fox 8 in High Point. “I’ll be doing a little bit of everything,” Mota says. “I’ll be writing some of the news that will air on TV. I will have the opportunity to follow reporters as they do live reports, and I will learn how to do everything both in front of the camera and behind the scenes. High Point University recently hosted the annual North Carolina Sirsi Users Group meeting, featuring Stephen Abram, vice president for innovation and chief strategist for SirsiDynix Institute, as the keynote speaker. In addition to Abram, five Sirsi Dynix executives attended the event, and were able to answer questions from the 114 librarians who attended the daylong meeting. Honors students at High Point University now have a chance for a unique residential living experience thanks to a new program that will house the students all on one floor. Gail Tuttle, vice president for student life, explains that the program is a privilege for Honors students. In addition to students, a faculty in residence will reside on the floor as well ? Dr. Matthew DeSantis, assistant professor of political science.